And Laura, your superb Russian deck reminded me; one of my favourite playing card decks (I only have 5 absolute favourites, I promise) is what is known as the Slav Costumes playing card deck, published by Fournier as Traditional Russian Playing Cards. It was originally published by the State Printing Works of Leningrad in 1928 and a while back I picked up a 1st edition (actually from Russia, from 1928.) for about 8 GBP on ebay. I love this classic deck and have various copies of the various editions. Ah! The art of yours is so very similar. Though my courts all have white wigs. But they could be the same artist. So now I have a clue as to where they are from. Thank you! I'd assumed they were Ukrainian since my roommate was, and she was so into the culture (especially traditional pysanka, she was a true artist with those eggs). Yeah -- found a couple of decks almost like mine on eBay. Different backs and another small difference or two, but nearly the same. Ah! The art of yours is so very similar. Though my courts all have white wigs. But they could be the same artist. So now I have a clue as to where they are from. In the light of day I have photographed some cards from them (the other link I had was only of the box of the double deck set). The first picture is the Piatnik edition, the second is the Fournier edition. Love the Russian Le Fanu. I have been reading lately with the Russisches, not the Majors, and what I like about this deck is the size, taller and thinner than the standard playing card. When you say Russisches, do you mean that Piatnik Russische Tiertarock? I also use that without the Majors, though the Majors are really very beautiful, I just don't have divinatory meanings for Unicorns and Elephants and stuff. Something to work on one rainy day! I find that for practical use though I like my cards to be reversible and have indices in the corners. I love all kinds of cards but I find that nowadays I like them to have this, makes things easier. They are my nostalgic pack which remind me of long hours spent as a child playing cards with my grandmother. "Recently, I got the 'Charta Bellica' cards from the Somerville site. They arrived! Are the images triggering ideas for you? They are in my hands now. The images are really expressive and you get a full range of courtly personalities. I'm just writing down thoughts on what they could mean in a reading for now as well as using them to play patience to get to know them a little better. Nobody has mentioned Cardshark's decks yet. I have the Heirloom deck, which I love. 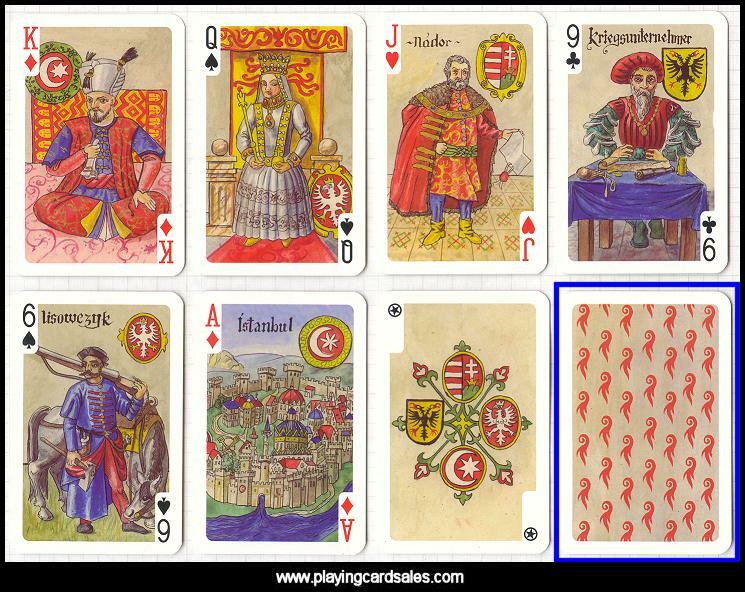 It has interchangeable court cards (comes with 24 courts); you can either have fancy French ones or the more traditional Anglo-American 19th Century Poker deck style.